Many pollinator species have suffered serious declines in recent years. Unfortunately, most of our landscapes offer little in the way of appropriate habitat, forage, and housing. Even the most beautiful gardens are not always healthy ecosystems. Design choices, plant selections, and maintenance practices can make a huge difference in creating your own healthy ecosystem, filled with life. As a garden designer, I use variations of this landscape plan for many gardens to attract the greatest varieties of pollinators. Mason bee habitats attract pollinators to your garden also. 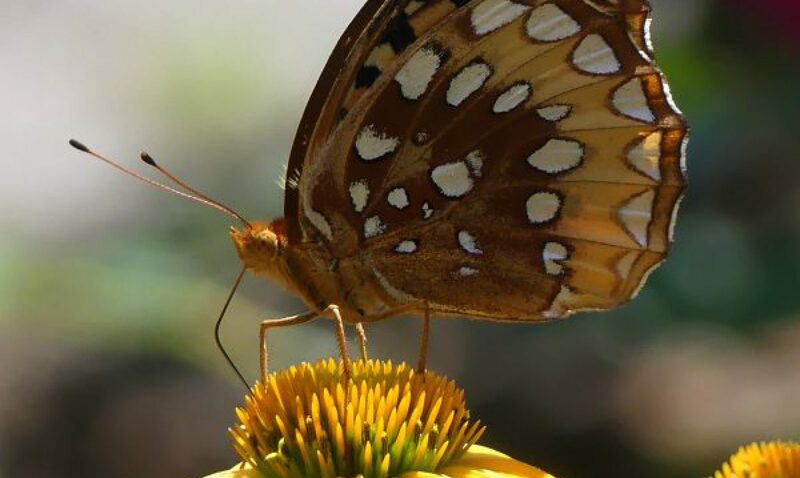 Simple strategies, such as providing bee habitats and gardening with an ecological community approach, contributes to species diversity, attracting and supporting more birds, butterflies, pollinators, and beneficial insects. Paper tubes or straws provide nesting areas for mason bees which are pollinator powerhouses, much more efficient than honeybees. Tubes of any kind can be used, like bamboo or hollow stems of sunflowers or other thick stemmed plants. Mixing shrubs and trees with perennials, annuals, and bulbs creates an all-season show of blooms for foraging bees for both pollen and nectar. Many of the plants are also host plants for caterpillars that produce butterflies. And caterpillars are the protein rich food that keeps our songbirds going as it is the primary food that many birds feed their young. For example in my plan, willows are known to shelter tiny overwintering Viceroy Butterfly larvae rolled up in a leaf. You could also plant an Oak nearby as according to Doug Tallamy of ‘Bringing Nature Home’, oak trees are top of the list for providing a host to hundreds of caterpillar species, critical for providing essential food source for birds and their young. It is important to include both herbaceous and woody plants in your pollinator garden. Trees and shrubs not only provide pollinators with food but also offer protected areas from the wind and predators. Also, remember to plan for a sequence of blooms, staggering the flowering time of nectar sources so that butterflies will frequent your garden throughout the season. Water is an essential for attracting pollinators, and something as simple as a birdbath will work. Mud is the other ingredient that pollinators are seeking when they lay their eggs into the paper tubes that you put out for their use. So, don’t mulch every garden bed. Meadow creation is an option if you have a large wide open area in full sun. Using a newspaper layer on top of the grass to smother it, you add compost on top and scatter wildflower seed. You need a sunny spot in your yard for a pollinator garden to be at its best. If your garden is shady but you have a sunny patio, plant containers full of annuals and perennials instead. For recipes on planting pollinator-friendly containers, go to Nectar in a Pot-Movable Feast. Don’t excessively manicure your yard. Leaf litter, tall grass, stumps, and peeling bark provide pollinators ideal places to spend the night or to overwinter. For more information on what plants to plant specific to pollinators, go to Plant These For Bees. I’m glad you advocate a degree of “untidiness” in the landscape. A manicured lawn is a veritable desert. Yes, I agree! There are way too many of them and not enough wild areas.